Judith, you are the President and a founding member of North Oakland Village (NOV). How did you get involved? In December 2007, I saw a story in the San Francisco Chronicle about the Village concept, a whole new way to support people who want to stay in their own homes as they age —and thought, what a great idea. I have lived in my home for 31 years and used to jokingly say I’d like to stay here until they carried me out. I thought others must feel the same about aging in their homes. So I put a notice in the local Piedmont Avenue area newsletter, PANIL Notes. A dozen people came to the first meeting in February 2008 in my home. We had several follow up meetings and new people came from the community each time, ending up with a core group of 8-10 people who really wanted to work on this. We discussed different models, from strictly volunteer to fee-for-service non-profit. Some people were already volunteering to help their elderly neighbors and were not interested in anything more organized. At the time I was doing volunteer work and could see how hard it is to set boundaries as a volunteer and to run a consistent program without someone whose job it is to organize and direct it. I strongly preferred the Beacon Hill (Boston) model with paid staff and a volunteer component. The beginning was very exciting; we got charged up! Then we had to face the hard slog of what it meant to get the thing running. You must have services available to attract members to the organization, but don’t yet have the resources to develop services. We received about $9,000 in donations which we’ve been running on. I took a class on Board development at Cal State which was helpful at the time. It has been very much a cooperative endeavor, with assistance from other villages. Village to Village Network, which supports the development of villages nationally, had a workshop in Oakland in early 2009. A couple of hundred people attended from around the Bay—Richmond, Berkeley, Alameda, Oakland. It was very supportive to realize that we were part of a movement, with villages being created all over the country. Sandra, what drew you to take a leadership role in founding NOV? My church community had been talking about this exciting new idea called a Senior Village as part of our Elderberries Ministry. 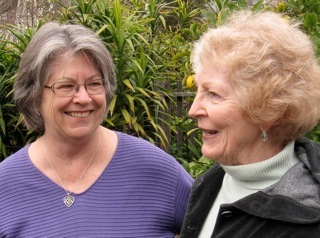 Reverend Elaine Reichert and I met Judith and another committed ‘villager’ Ruby Long at Starbucks in the Rockridge shopping center within a week of learning about the Piedmont Avenue group from two lines in a Montclarion article in June 2009. The timing could not have been better in terms of my own life. Aging with choice and with quality of life are very significant issues for me. I went to the very next meeting in July, 2009. At this meeting we came up with the name North Oakland Village, elected Judith as president, and formed ourselves as the Board. I am proud to be one of the seven founding board members. We formed the Executive committee a few months later, of which I am a member. We then started thinking about all the tasks ahead of us —state incorporation, bylaws, 501(c)(3) status, a business plan—and began work to accomplish them. Judith is right about the cooperative spirit that exists among Villages. We had full use of templates and models from Village to Village Network, San Francisco Village and Ashby Village in Berkeley to develop our own organizational structure, forms and procedures. What is your hope for the rest of the journey, Judith? One of my hopes for this Village is to build community. I find that like all of us, as we age and lose people, it’s harder to make new friends. One of my dreams is that North Oakland Village will provide a pool of people to call on if you want to go to a movie or take a walk or just have someone to go out for coffee with. For the future, I would love to see a spiritual component to it, a kind of community chaplaincy idea. I like having events. For example, we had an event in May 2010 to thank our donors (of money & time), to say to the community “we’re here!”, and to reach out to prospective members and volunteers. We had about 60 people at Plymouth United Church of Christ in Oakland. A Montclarion reporter wrote a nice article which made it into the Tribune, and others contacted us as a result. I don’t want to see the heart go out of the village. We want to keep it a Village—not professionalize it to the point where it doesn’t feel personal anymore. The fact that we are Village members as well as Board members is deliberate. The heart needs to stay in the Village. What do you see for your future in the Village, Sandra? This is not a church community, but it a very spiritual commitment. I think we have so much to offer each other by staying connected. For example, I am excited about developing another new component of the services NOV offers. We call this “Transitions Time.” It is about helping members make the transition from their homes to a service-rich, assisted living environment, if and when this needs to happen. I am excited and rewarded by working with a network of individuals who bring new observations, questions and insights to our growing NOV. I can see that the Village is coming together and there is an entity here. You just keep on doing the work, and all of a sudden the clouds part and the sun shines! Specifically, I want to welcome volunteers and help them do meaningful work for NOV that matches their talents. I see the Village as a place for us to continue to experience our worth and value in community and to enjoy the richness of our lives. Judith Coates is a chaplain for Sutter Hospice. Sandra Davidson is a retired adult teacher and community volunteer.